Personalized Halloween Trick or treat tote candy gift Pumpkin bag. Add any name. halloween candy gift bag is 17.3x 13.2 inch，8.7inch is the measurements without handles. Perfect for that Trick or Treat night，will last for many years . 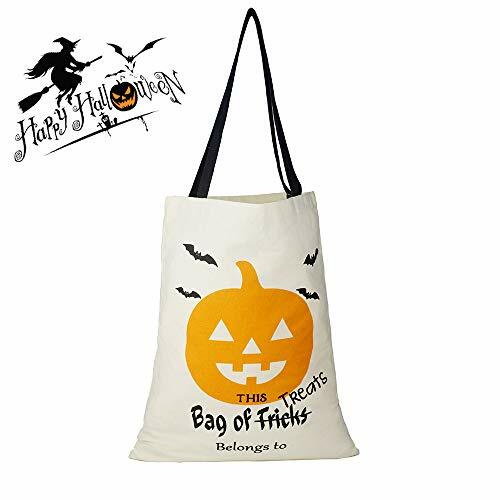 Include Package: 1x Halloween trick or treat tote bag It will come Blank ，you can be Personalized To start a Halloween BOO, one neighbor secretly leaves a small gift bag, a BOO poem, BOO instructions and a BOO sign at a neighbor's doorstep. "You've been BOOed! Welcome to the wonderful world of Halloween BOO-ing! " In turn, the neighbor is asked to BOO two other households, leading to a chain reaction--and Halloween fun. CARE INSTRUCTIONS - Turn bag inside out, and wash in cold water. Dry on low or lay flat to dry. Do not iron on design.